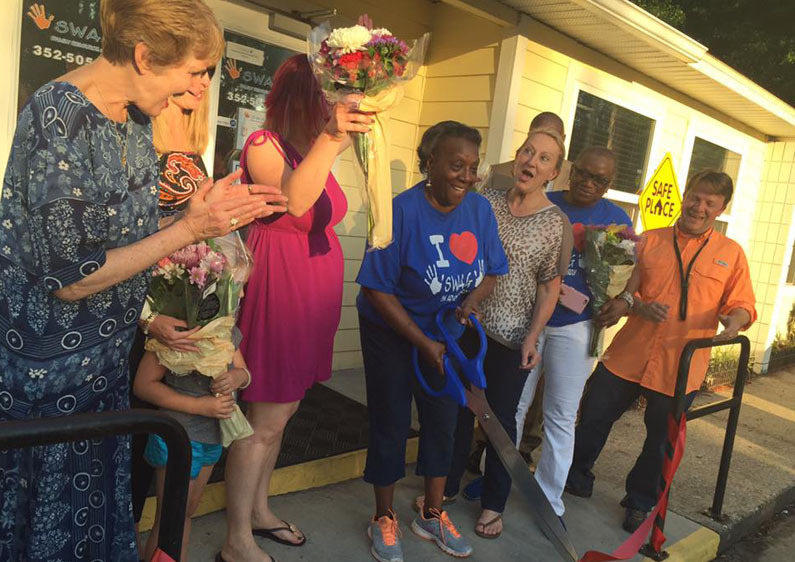 The NC160 Leadership project was an extreme makeover for SWAG Family Resource Center in Gainesville, Florida. Two sisters from the West Indies started the SWAG Family Resource Center. The sisters were immigrants themselves and wanted to give back to the community in their retirement. The center has served over 15,000 patients in 2015 alone. The project transformed the toddler room into a multipurpose room including a library, young children’s play and lounge area, additional tables and chairs, a whiteboard, workstations and rugs. Storage shelving and cabinets were provided for the utility rooms and adolescent room. The team painted the Center including the toddler room, reception area, kitchen, computer area, hallways, and the resource counselor’s office. Storage cabinets were installed in each bathroom over the toilets. The team went through 4000 books, sorted them, and moved them into the new library area after coding them by educational level. They improved the resource counselor’s office by adding a table and chair and a new rug. Outside, they power washed the building, updated, repaired and mulched ten raised gardens. Finally, they updated the front of the building with new plants, new mulch, and garden fencing along the beds. In doing this, they created a clean, pretty, comfortable, safe place for children to come and do homework, get tutoring, read books and work on the computer. Through this project The Leadership Team transformed the environment at the SWAG Family Resource Center into a space that is warm and inviting. They created a comfortable, safe place for children to hang out and do homework or play games with friends, get tutoring, read books and work on the computer.